I know you could never tell on Instagram, or Facebook, or Twitter, but we really do go through seasons with our dog. Just like relationships, sometimes it's just awesome and sometimes it just feels a little... off. People told us before we got her, when we (Logan) were weighing the options (I was really just weighing the pros and ignoring the cons and begging Logan with cost projections and pictures of the cutest rescue puppies I could find online - even if they were in Arizona), that getting a puppy is a great introduction to parenthood. Like I said, we go through seasons with Gracie. I think on the part of all three of us - sometimes she's just more loving, sometimes we're just more interested, sometimes we're busy and she's mad at us for it... and any combination thereof. But lately... Lately we are just smitten all over again. When Logan walks in and her first instinct is to crawl up on the couch with him and bury her face in his chest - how can your heart not grow a couple sizes? It doesn't help that I bathed her last night. So her precious spotted fur is as soft as her puppy fur was, and smells like Johnson's baby shampoo. I contemplated skipping work this morning so I could just curl up on the couch with her and watch TV all day. It's just that great. I know. People think we're crazy. People think "it's just a dog" and I get that. She is just a dog. She will die some day (Logan reminds me every day so I won't need extensive therapy from the shock - I probably still will), and life will go on. But unless you have felt and known the love and loyalty and affection of a dog, I don't expect you to understand. I'm sure once we do have kids our love for Gracie will pale in comparison to the love of a child, but for now, she is our baby. And we love her. And we spoil her and we plan our schedule around her, and she is our family. And I wouldn't have it any other way. She was one of the best decisions of our marriage. Somewhere around a year ago I could feel the house fever setting in, and before I knew it I was having full out heated arguments with Logan over whether or not we could buy a house. It was silly. I was just overcome with this longing for an office to house my crazy supplies and creativity, and it grew into the house monster. So after finally admitting to myself that Logan was, in fact, right, and we shouldn't buy a house just yet, I decided to make some changes. We gave away our old (wonderful) couch to make room for a smaller leather one. This was a huge facelift for our little apartment. We got a cool rug. We rearranged. I refinished our TV stand. We got some decorative shelves for the living room. But for some reason it just didn't quite feel finished, you know what I mean? With the smaller couch, we moved it further up in our living room so I could have a lot of space behind it (next to the big, beautiful window) to work on Lemon Tree stuff. My printers already had their own buffet back there, and the console table behind the couch serves as my work area when cutting and packaging... but I felt so discombobulated constantly hiding my supplies in the closet or buffet and digging them out again two days later. I took off work the Friday and Monday of my website launch weekend (oh yeah, that happened! ), and when I came home on Thursday our house was COVERED in boxes. I ordered loads of supplies so I could get all the upfront costs out of the way, and I had planned to clean out my craft closet and store everything in there - but, as usual, time had gotten away from me. In a last minute panic and moment of sympathy for Logan, I decided to clean the house and organize all the closets before the launch. This was probably the stupidest decision I made that weekend - next to maybe going out in public after four days of sitting at my computer, unshowered, in my pajamas. In my naiveté I thought it would only take a couple of hours. EIGHTEEN hours later I was STILL trying to get things organized and put away. It should have been a week long project. But I had started and I wasn't going to leave it unfinished before the launch (let's be honest - under normal circumstances I probably would have... Logan can vouch for this), so I kept begrudgingly plugging away. And amidst that hectic day of dumpster runs and breaking down boxes, I discovered I had the perfect place just begging for a desk. So I bought one. I learned that long weekend that a desk was all I ever needed to feel at home here. A space where I can spread my stuff, work through my thoughts, write, design, answer emails. A space that is MINE (and Logan's if he needs it) and doesn't double as a console table, a kitchen table, or my lap. I don't ever want to leave now. Since we got the couch I've felt like we'd finally really moved in but the desk really did it. The desk finished that process. We're here. We've nested. We love it, and we're not leaving any time soon. Thank you, bargain desk. For providing a place for me to be creative and feel wholly at home. Thank you for teaching me that the grass can be just as green where I am, if I just look in the right places. And thank you for helping me get my act together before my website launch, when nothing else really could. I love you, desk. Thank you. Sometimes the only thing that will make me feel better when I'm not feeling like myself is not a hug, a prayer, or a word of encouragement. It's not a warm cup of coffee or a slice of pie or a phone call from a long lost friend. It's not new clothes, a clean house, or my dog (yes, I do mean that). It's just my husband. To sit the corner chair in my office and remind me why I do what I do and that I am doing it as best I can. It's just him. How did I ever get so lucky to have him? I'm not sure why, but for years now this verse has stuck with me. I never really felt connected to the nativity story until a couple years ago when I guess I was just finally woman enough to identify with Mary. I was about to be married (that's the only reasonable explanation I have for suddenly feeling very connected to Mary) and for the first time in my life I was really contemplating the idea of giving birth to the savior of the world and how Mary must have felt. I think this verse struck me because I am the queen of TMI. I mean, there's merit to being an open book, but I compulsively tell people about things they a) don't care about, b) don't want to know about or c) all of the above. Logan used to get frustrated in college because if I got him a really sweet/funny card, I would write my message to him in it and then show all of my friends how sweet/funny the card was. There was no privacy in the message I was sending him. That was a valuable lesson. She was visited.. by an ANGEL.. and her response was to treasure everything that happened and ponder them in her heart. Not run and tell the first person who came to her mind, but treasure it. And ponder it. I would have put it in the newspaper for crying out loud! The few times in my life I have mustered the self-control to keep something private I have felt enormously strengthened by it. Pregnant friends, conversations between Logan and I... It's empowering to have knowledge that is just your own, and it becomes so precious and valuable to you. The few times I've done this, even if it's just something small, there is peace and understanding that comes as you contemplate something without sharing it immediately. In my experience, it allows time for God to speak to you about it before someone else taints it with their own opinions and perspectives. Or, worse, makes you feel dumb for even treasuring it in the first place. As is the case with most of my blog posts, there's really no earth-shattering point to this post beyond just my own way of working through my thoughts, but lately I have felt convicted to treasure more things - to ponder them in my heart instead of yelling them to the world. It is a wise and godly trait to choose your words and stories carefully. When God gives me little gifts by way of nature or kind words, my immediate reaction is to pull out my phone and tweet about it. Why is that? Today I caught myself doing that and instead I put it back in my pocket and actually took a moment to take it all in, and enjoy the secret that God and I could share together. No one else in the world knows about it. Treasure. In some way it makes me feel a little closer to Mary when I treasure things and ponder them in my heart. A few weeks ago we discovered a little bird's nest in our office's golf cart. It was a bit of a predicament because the President's Office needed to use the cart that day. That's why we discovered it in the first place. But despite the trip across campus and hauling some guests around, somehow the nest remained in tact and once the golf cart was back in its parking spot the little birdie flew right back home without hesitation to sit on her three speckled eggs. Throughout these past few weeks, it's been so sweet to watch the little guys hatch, open their eyes, get their feathers, and cheep for food. It's become a small high point to go out there and admire them for a few minutes every day, snap a photo, and marvel at the magnificence of God's handiwork. We haven't had rain here since about the time I got back from India and it's felt so oppressive to see the earth so dry. It finally got really cloudy and breezy today and you could feel the sky just waiting to burst at any moment with warm summer showers. I felt so relieved at the thought of a good, strong, redeeming rain for this dry, hot summer so I went to see my little cheeps and enjoy the weather under the overhang by our building door. It's a small disappointment in a lifetime of small moments in the day, and in some way I also feel so full that their little lives have finally really begun, but man. If this is a tiny nibble of a taste at what being a mom with kids going off to college feels like then count me out. I already miss them, and I only saw them for all of two minutes per day. But in this I am thankful for the wonderment and beauty of the living breathing Earth that is around us. I am thankful for getting to watch a little snapshot of life as it was intended for a couple of weeks. I am thankful for the rain, and the life it brings. I am thankful for the moments of love that God gifts us in small things such as this. Let me preface this by saying: I should really be working on Lemon Tree stuff right now, but I can't help but feel reflective and I never write any of my thoughts down any more because it seems I'm always working on Lemon Tree. So this is my mini break for a little written reflection. 2012 has been an incredible year already. God is revealing Himself more to me everyday, and gently revealing the many planks I need to remove from my eyes. It feels refreshing and humbling to hear the Spirit making you aware of your shortcomings. Like a child getting tips from their dad on how they can throw the baseball better. I'm learning a lot through this, too, because I like to pretend that once I master the problem one moment, I won't have to worry about it the next. False. It is always a recurring battle, and although I still lose sometimes, I'm definitely starting to win more often. Thanks, God! I feel like this season of my life needs to be documented, in some small way (like this blog post), simply because it's the first time in a long time that I've really felt a huge shift in perspective, and in more than one way. I think the last time this happened was when I got to college. I have gone through all sorts of seasons and learned all sorts of clear lessons along the way, but there are only those few pivotal moments in life when suddenly you feel like you're waking up and you can't believe you were even sleeping before. The first lesson God is leading me through is that faith is real. It isn't something we just talk about, or sing about. It changes things. And the opposite of this is true, too. Evil is real. It is ever-present and Satan is always looking for footholds in my heart. The minute I let him get one, it might take me years to get him out. My eyes were fully opened to the reality of faith and evil when I was in India. To make a very long and emotional story short, we witnessed (more or less - I couldn't stand to watch) an animal sacrifice in the Hindu temple, dedicated to Kali, the goddess of destruction, in Kolkata. All I really remember is the oppressive Indian heat, the screaming bleats of the sweet little goat, the pounding echoes of the ceremonial drums, and the hot, heavy tears streaming down my cheeks. It was like all at once - in the house of Satan - God stripped everything away and showed me the reality of the warfare around us. I felt a little like He slapped me across the face, but I knew I deserved it and I went running to Him anyway. I hate stepping on peoples' toes, so I like to be tolerant of other religions because it's easy, and it's nice, and it's polite. It's the American thing to do, right? I always felt sorry for people who not only didn't know Christ, but people who worshipped other gods. I just thought, "Oh, poor them. They are so lost and they have no idea. What a shame." But after experiencing the influence of Satan up close and personal - in many more encounters than just the Hindu temple - I think my blinders have finally been lifted. And let me tell you, I was angry. I wanted to burn the entire temple to the ground. I wanted to smash the tiny idols in the bus that took us everywhere. I was utterly appalled at the blatant disrespect of our savior in that city. I'm sure in some ways this was misplaced, and in others this was justified - but in any case it's how I felt. I feel so foolish for having been so naive. I felt like their prayers just went no where, that they were talking to air when they burned their incense and offered their fruits. But if you are not for God, then you are against Him. It's real. Even though their actions may simply be misguided, it doesn't matter. It's real. This is impacting me daily, because I actually feel like I am constantly at battle with the sinful nature within me. I don't want to say to God that I have faith in Him and Him alone, and then turn around and let Satan in the next. I don't want any part of the presence that I felt in that temple - it's the exact same presence that makes a home in my heart when I let it. I think God finally confronted me with the bitter reality that you can't just smile and nod and not think about the underlying implications of our faith. I don't even know if any of that made sense, but it's clear to me so I guess that's all that matters. And this is not to say that I don't love those people. I do. Almost every person we worked with in India wasn't a believer and oh my goodness I love them. But I hate the gods they worship. I hate that they don't know the living God and His incredible power and grace. I hate that they are so lost. This realization just empowers me to finally do something about that. The second lesson that God has been teaching me is that my story will not look like any one else's. No one's story will look like anyone else's. It's just a fact, and I should celebrate that. How wonderfully creative to make every person and their situation so unique! (I can appreciate that now - and it makes me SO excited!) Instead I get poisoned with comparing my life to those around me. And believe me - it's the most toxic thing you can do to yourself. I would literally go days of just being burdened and heavy hearted. I didn't even know why! I would just read Twitter and it didn't matter what people were even saying - I would just either well up with tears or get angry. I knew it was irrational, but I'd let Satan take such a huge portion of my heart and just fill it with all sorts of jealousy and hurtful thoughts and it took over my mind. I coveted everything that everyone had around me - and I feel like I missed almost two months of my life to this disease. Fortunately, I have an unbelievably patient husband who has argued me out of this. I feel like he fought for the small piece of Christ in me when I couldn't even see how poisoned I'd become. I am so grateful that he pulled me out of that filthy rut. I don't deserve him. And this is the battle that continues to rage within me, but after one repentant, heartfelt prayer, and more that followed every day, God began and continues to heal my heart. He has been revealing to me the beauty of a unique story. No one I know has the same story as anyone else - so why would I want it either? I am so thankful for the amazing blessings He has given to us, why would I dishonor Him by wanting something else? I am so glad that I've come around to the other side of this, and I'm just going to keep praying that I can continue winning this battle. So there it is. This was really just for me, and I doubt anyone reads this old thing anymore anyway. :) But I feel so much better that I've put into words the amazing ways that God is moving in my life... and that's just to name a few! I am so humbled and amazed by His love. We do everything wrong, and somehow He still waits patiently for us to come running to Him. And I did. And I still am. I hope you are, too. One of many things that I did over Christmas break was make a gift for a couple of close friends of mine. My friend Jay had a simple request for his wife, Meredith: to paint their vows on a canvas to hang in their home. When he "hired" me to create this gift for Meredith, I immediately decided to throw out the idea of a canvas just because it's really hard to keep them from looking cheap, despite many different paint/mod podge/etc tutorials you can find online. It always ends up looking like a $10 canvas in my opinion. Jay gave me the freedom to do whatever I thought looked best, since Meredith was my roommate for two years in college and I know her taste pretty well. So after much deliberation, a coworker and I traded talents to accomplish what I wanted Meredith's gift to look like. Josh is incredibly talented at carpentry and painting, so I photoshopped his Christmas card photo for him in exchange for a 2'x2' wooden piece - planks held together with screws, painted, distressed and just beautiful. He did an amazing job. The next step: getting the vows onto the wood. So this brings me to why I decided to write a blog post on this. I did an endless amount of research on transfers and cutting vinyl, painting, projecting, stenciling, etc, but nothing seemed easy and efficient enough to ENSURE that this thing looked awesome. Vows aren't short, so free handing was out of the question. I wanted this gift to look professional and beautiful since it was going to hang in the Brocklebanks' home for years to come. What did it come down to? Trial and error. 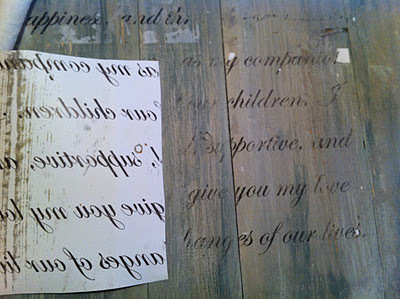 So I'm here to share with the blogosphere what TO do and NOT to do when attempting to transfer text onto painted wood. Because nothing I found was easy enough to do without days of work or special products, and I don't want anyone to have to go through the trouble I did figuring it out. First of all, let me show you to finished product. If I must say so myself, I'm pretty darn crazy about it. If it weren't tacky to do so, I'd totally make one for me and Logan... but this is something special only Jay and Meredith should have. It would be way less special if I had one hanging in our home, too. 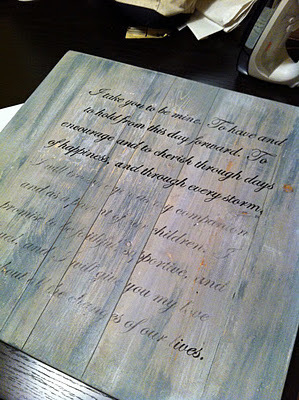 However, I may transfer a quote or something onto another wood piece - just because I love it that much. So Josh, who made the wood piece for me, told me that he'd heard that you could take an image, reverse it, print it on a laser printer, and iron it to get it to transfer onto wood. This made sense to me, since laser printers use toner and heated toner leaves the paper... but it sounded way to good to be true. Spoiler: it was. But in the long run the overall concept DOES work. Heads up: This first part is really designer-y and I'm not sure what to suggest if you don't know how to use Adobe Creative Suite, but I'm putting it out there because this is how I did it... and I'm sure if you get the idea of what I did you can be creative and do the same thing through Word or Pages. 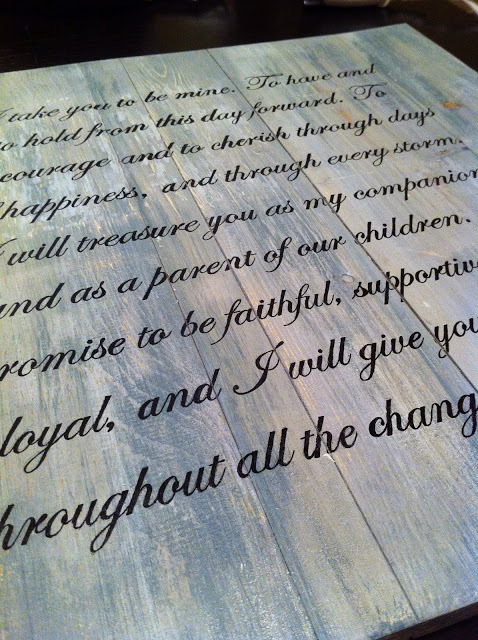 So I made a document in Illustrator the size of the wood piece and I put the vows where I wanted them to go, in the typeface I wanted, so I could see how they would fit onto the wood piece. Then, I placed four 8.5"x11" rectangles onto the document until all of the text was covered. This allowed me to print the four sections of the text on a regular printer and match them up to get the 2'x2' square of text that I wanted. I simply (graphic design terms here) selected one rectangle and the text, clipped it, and put it into a new 8.5"x11" document for printing. After I did one, I'd undo it, and do the next until I had all four sections of the text. Okay we're done with the designer lingo. Basically: find a way to print the text onto regular size sheets and match them up to make one big one. My first mistake: I forgot to reverse the text. So now that I had my text, I was just going to match them up, iron them, and call it a day.. right? 1. DO NOT USE PHOTO PAPER. 2. DO NOT LET THE PAPER COOL (Josh told me this - smart guy!). 3. DO NOT PUT WATER ON THE PAPER. So let me walk you through the best way to transfer then, in pictures. I know everyone loves pictures when it comes to a tutorial. First let me explain that I had used the regular paper taped together (make sure no tape is exposed or you'll melt it to the wood! I used double sided tape sandwiched between the two layers of paper), so I already had the first transfer that I had to match up with. You will hopefully be starting from scratch, so just make sure you're placing your paper where you want it to be transferred. So in my case, I had to lay each piece of paper down (out of four total) to match up exactly with where I had already transferred. Again, I'm using MATTE brochure paper at this point. Then, turn your iron onto high with the STEAM OFF. Rub the iron over the paper firmly and slowly, but not slowly enough to burn the paper. You may have to hold your paper in place for the first few sweeps, but hopefully after that the toner will start sticking and your paper will stay in place. 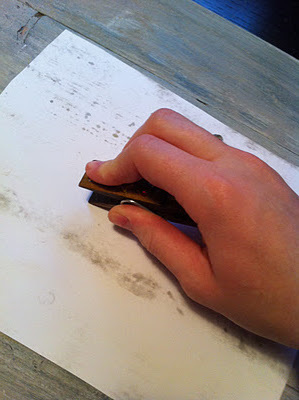 Keep the paper warm at all times and peel it back in each corner periodically to see where you're missing transfers. In the places you're having a hard time, heat it well with the iron and then use an object such as a wide close pin (that's what I used) to rub down firmly on the area. Let me tell you: this is NOT a short process. It took me at least 30 minutes per sheet, and that was after already having lightly transferred the text on the night before. Be patient. After you've peeled back most the areas and you feel good about what you see, heat the whole piece really well and pull the whole thing off. Note that if there is sap on the wood, it will get sticky and melt... but in my opinion this just added to the overall shabby chic look of everything. Now... I liked the way it looked afterward because it naturally looks worn and distressed since the whole text will not transfer perfectly. However, I didn't think Meredith would love that much distressing so I wanted to make the text VERY clear. Also, since it was going to hang in their home for years to come I wanted it to start out very crisp in case it fades over the years. It's a long process, but in my opinion it completely made the piece look finished - and Meredith said use loved opening this present on Christmas day! So ultimately, transferring onto wood isn't the walk in the park that I'd hoped it would be, but it's definitely worth it to get a professional finish on something. 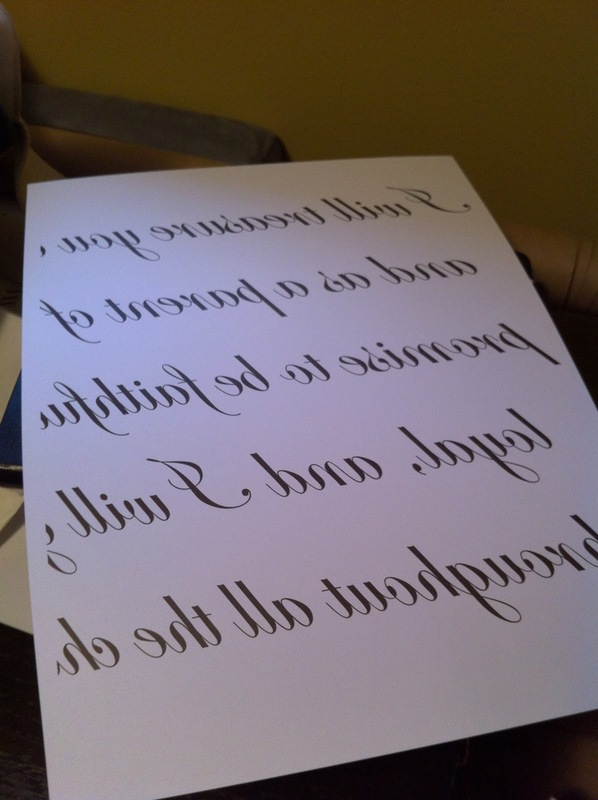 Without the transfer, there's no way that I could have perfectly written the text to look so beautiful. And while some things look great with more of a hand-created touch, this piece definitely looks better with a cleaner finish. I hope this helps anyone wanting to transfer text onto wood and I hope you guys are having a happy holiday season! I don't have a fun crafty project to post today, because I realized that's all I've been writing about lately and the original intent of this blog was to be able to keep up with Logan and me and how our marriage and life is going (and before that, our wedding planning). So I thought I'd take a minute to reflect on life since our wedding, in honor of us being married for exactly three months today. Wow, it feels like so much longer than that and it went by so fast at the same time! At church recently a friend asked me what marriage has taught me. And honestly, at that point I had absolutely no answer for her. It was only about a month and a half after our wedding when she asked, and it was still just rainbows and sunshine and smooth sailing. Not to say at three months I've really figured it all out (Ha! Do we ever? ), but I am definitely learning now. I have put on just a tiny bit of weight since the wedding (you know, the kind only you notice but you feel like everyone can see), and Logan, being the incredibly supportive and encouraging husband he is, suggested that we start exercising in the mornings before I go to work and he starts his freelance day. He said this after many long, whiney conversations of me complaining about it... I don't want you guys to get the idea that he wanted me to lose the weight or anything. :) So we have started doing that, and it feels awesome. Anyway, the reason I give you that background is because it has also made me incredibly exhausted this week. I was spoiled with nine hours of sleep every night, and now I get seven.. which is still fine, I just haven't adjusted yet. So that being said, it's been kind of a tough week for me in terms of being a wife. Everything is just harder when you don't have a lot of energy. One night I had made dinner for myself while Logan was out, and crashed on the couch to watch some TV and just relax. Naturally, he came home before I had any time to clean it up, so when he got there I just threw the dishes in the sink so I could spend time with him. Some more background: Logan is the cleanest, neatest person I've ever met. I've heard stories from his mom that he wasn't always this way, but I'm so thankful for his obsession with tidiness because it keeps our home sparkling all the time. So back to the story: I threw the dishes in the sink, knowing that it bothers him when they sit there, and asked if I could wash them in the morning because I was just. that. tired. He said that was fine, and I went to wash my face and get ready for bed. Okay I'm going into WAYY to much detail here, but anyway. I put my clothes in the dryer before I went to bed, and those dishes were sitting there. Staring me in my face. And I thought to myself "I do this once. I leave them overnight once, and bam. It's happening all the time. I know this bothers Logan, so I'm just going to go ahead and do them so that neither of us have to think about it tomorrow." As I stood there washing those dishes with my sleepy eyes, I thought about all of the ways that I used to show Logan my love, and how marriage has changed that. It used to be making time for him, calling him, listening to him and communicating with him. I used to show him that I cared for him deeply by seeking him out during the day to just give him a kiss or tell him how much I loved him... but that's all different now. We already do those things, because it's a part of our lifestyle now. I don't have to make time for him because our down time is usually already spent together. I don't need to call him because we usually aren't apart for very long. The ways that I show him I love him have now become doing the dishes when I don't want to, because I know it makes him feel at ease. It's putting away the clothes I tried on that I didn't end up wearing to work because I don't want the room to be messy for him while he works there all day. My love manifests in such completely different ways now that we're married, and it's so funny because for so long I just thought those things I'd have to do when we were married was going to be out of shame of me not being as clean as him, or out of embarrassment because I didn't want our friends to think we're messy if they came over. But it's all out of love. Because Logan feels better when I do those things. I also realized while I drowsily scrubbed my pots and pans, that marriage is a constant struggle to remain patient. At first it doesn't take any work because you're excited and eager to be a great spouse and you just want to bend over backward for them. But then you get tired and bogged down with work and the pace of life, and having someone else to constantly think about can just wear on you. It's a beautiful wearing because you love them so deeply, but it isn't always easy. It doesn't always come naturally. I mean, we're definitely still in the honeymoon phase. I still wake up and think "This is the most exciting thing ever!" laying next to him, but it definitely has started feeling more like a journey now, and less like a weekend retreat. So now that I have consciously (that's debatable, given my state when I realized these things) realized what I have learned so far in our marriage, I am working to do more of those little things for Logan.. like cooking him dinner and taking out the trash instead of waiting for him to. And I feel renewed in my patience, after having it prematurely wear thin.